This cuddly signing teddy bear is a wonderful way for parents to play with children or for instructors to welcome children to their Signing Smart play classes, story times, preview classes, etc. 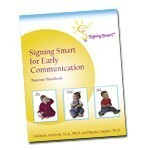 It is the perfect companion to playtime or for teaching signs and Signing Smart strategies. Your arms fit into her arms, making the bear "come alive" to sign with eager infants and toddlers! The bear comes with gloves for your hands and is approx 25 inches tall from head to toe and her arms are 8" long.